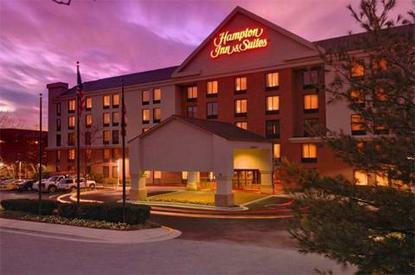 Hampton Inn & Suites Annapolis is located off Route 50-301 in a suburban setting 2 miles southwest of the University of Maryland. Area attractions include the Annapolis Mall with 160 specialty shops, historic sites, walking tours at the US Naval Academy, golf courses, and the Inner Harbor in Baltimore, 25 miles northwest of the hotel. Within 2 miles you can dine at Mike's Crab House, Applebee's, Outback Steak House, or Paul's. We feature a beautifully decorated lobby accented with a fireplace and cathedral ceiling, billiard room, fitness room, outdoor heated (seasonal) pool, meeting room, 24-hour convenience store, and executive center with free business services. Our spacious guestrooms are equipped with coffee maker, hair dryer, iron/ironing board, two-line phones, voice mail, dataport, and TV with LodgeNet. Each suite features a fully equipped kitchen, living area, and private bedroom. Amenities include ''On the House'' hot breakfast bar with more than 30 items, free local and credit card access calls, local and national newspapers. We also offer a limited number of connecting rooms, cribs, and cots upon request. Laundry/valet service, guest laundromat, meeting/banquet facilities, and audio visual equipment are available for a nominal fee.